In medicine (dermatology), there are several different types of cancer referred to under the general label of skin cancer. The most common types are squamous cell carcinoma (SCC) and basal cell carcinoma (BCC), which may be locally disfiguring but unlikely to spread to other parts of the body. The most dangerous type is malignant melanoma, which can be fatal if not treated early, but forms only a small number of all skin cancers. Skin cancer is an increasingly common condition, in part attributed to increased exposure to ultraviolet radiation, against which no level of sun screens offer any decisive protection. The increased exposure is mainly due to the recent popularity of sun tanning (sun bathing), but in part also due to ozone depletion and the consequently increased levels of ultraviolet radiation. The chance of getting skin cancer doubles every time a person gets a suntan or sunburn. Lighter-skinned individuals are more vulnerable. In the United States, about one out of every three new cancer cases is a skin cancer. Minor surface skin cancers are readily treatable by simple surgery, but if the cancer is allowed to grow then it will penetrate through the layers of skin and affect the lymphatic system. It may also metastasize and spread to other parts of the body. There are a variety of different skin cancer symptoms. These include sores or changes in the skin that do not heal, ulcers in the skin, discoloring in parts of the skin, and changes in existing moles. Squamous cell carcinoma is commonly a red, scaling, thickened patch on sun-exposed skin. Ulceration and bleeding may occur. When SCC is not treated, it may develop into a large mass. Most malignant melanomas are brown to black looking lesions. Signs that might indicate a malignant melanoma include change in size, shape, color or elevation of a mole. The appearance of a new mole during adulthood, or new pain, itching, ulceration or bleeding of an existing mole should be checked. Squamous cell carcinoma is a malignant epithelial tumor which originates in epidermis, squamous mucosa or areas of squamous metaplasia. Macroscopically, the tumor is often elevated, fungating, or may be ulcerated with irregular borders. 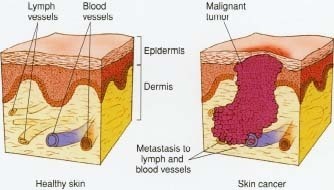 Microscopically, tumor cells destroy the basement membrane and form sheets or compact masses which invade the subjacent connective tissue (dermis). In well differentiated carcinomas, tumor cells are pleomorphic/atypical, but resembling normal keratinocytes from prickle layer (large, polygonal, with abundant eosinophilic (pink) cytoplasm and central nucleus). Their disposal tends to be similar to that of normal epidermis: immature/basal cells at the periphery, becoming more mature to the centre of the tumor masses. Tumor cells transform into keratinized squames and form round nodules with concentric, laminated layers, called cell nests or epithelial/keratinous pearls. The surrounding stroma is reduced and contains inflammatory infiltrate (lymphocytes). Poorly differentiated squamous carcinomas contain more pleomorphic cells and no keratinization.